Pedestrian barriers are an indispensable element of any country’s infrastructure; most roads and pavements require proper safety measures such as barriers for those that are walking, especially roads near schools and highly-congested city roads. In addition to our wide range of fencing products, we are thrilled to offer safety barriers, pedestrian barriers, crowd barriers, among others. Not only have our products proven to be effective in various road systems – they are made to last. In service they will certainly stand the test of time. 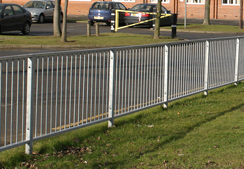 PeartPedestrian barriers are available in a wide range of specifications to suit all site conditions. Pedestrian barriers are generally 2.0m long and 1.05m in height with the framework constructed from 50 x 30mm rectangular hollow section. Infill panels, in-line or angled, are designed to provide road users the best view of traffic and pedestrian movement. Panels can be manufactured to a radius to meet the requirements of site and are hot dip galvanised to BS EN ISO 1461:1999 after manufacture. Peart pedestrian barriers are available in a wide range of specifications to suit all site conditions. Pedestrian barriers are generally 2.0m long and 1.05m in height with a framework constructed from 50 x 30mm rectangular hollow section. Our fill panels, in-line panels and angled panels are designed to provide both drivers and on-site workers the best possible view of traffic and pedestrian movement. Panels can be manufactured to a specific radius in order to meet the requirements of individual sites and are hot-dip galvanised to BS EN ISO 1461:1999 specifications after manufacture. A range of infill panels can be manufactured from 12 – 22mm diameter bar and from 13mm square sections to ensure good visibility through the barriers. The suggested specifications are for general purpose barriers, and can be changed to meet specific site conditions. Road safety barriers are a popular sight in any town in the UK. Roads are reassessed and rebuilt everyday day in this country, and the use of pavements necessitates the inclusion of safety barriers for pedestrians, especially for use around schools and other areas where the young and old might be. Contact us today to learn more about how we can implement our safety barriers in your project. Infill panel from 12 – 22mm diameter bar. hollow section. Barrier supplied fully welded. Barrier supplied in kit form for assembly on site. A range of infill panels can be manufactured from 12 – 22mm diameter bar and from 13mm square section to ensure good visability through the barriers. Specifications suggested are for general purpose barriers and can be changed to meet specific site conditions. If you're in need of high-quality pedestrian barriers that has a long product life in service, contact us today! Peart Fencing has worked with businesses and organisations across the country, we’ve built a reputation out of excellent service and reliable products. If you have any questions about our products, feel free to contact us directly! We've worked diligently to ensure that each of our service representatives has gained extensive expertise in this particular industry. We've been recognised as one of the UK's most trusted and respected fencing and barrier fencing supplier in the country. Let us show you why we're considered one of the best in the business. Contact us today!